Pop Life had one of the biggest indie toy booths at SDCC. Their figures are designed by the likes of Ron English and Rob Prior, and they're made in China. Quite a diverse area of figures and color applications! The He Man figures were a mix of classic style figures, ReAction, and MUSCLE style toys. This was one of my favorite indie toy booths at SDCC 2017. This year, everything DKE Toys exhibited was custom, handmade carded figures. It made for a striking presentation, with a fantastic variety of creative high and low-brow figures. Considering how much attention the booth got, I think it was a big hit. Resin made Boba (cas)Sette. Fun! Pretty cool that along with this piece, Rep. John Lewis, a Civil Rights leader. was also at the show promoting the award-winning graphic novel series Merch. San Diego Comic Con always has a lot to see inside the convention center. But there's also plenty going on downtown, especially in the Gaslamp District. This year, one of the most amazing set ups was put together to promote the upcoming Blade Runner sequel. The "Blade Runner 2049 Experience" started you out with a cool virtual reality experience that was something of a stationery amusement park ride with a VR twist. There was also a motion component, including a chair that moved and vibrated as you chased down a replicant across the unmistakable Blade Runner skyline. Once that ended, you took off the VR goggles to find yourself in a movie scene full of vehicles, props, and actors. You could take as much time as you wanted to look around and explore the environment. Clearly a huge amount of work, care, and money went into creating the scene. The actors, including cops, pedestrians, shady characters, noodle shop owners, and even hookers, would talk with you to help create the illusion that you were there with Deckard looking for the replicant on the run. Here are pics of the environment, props, and actors, followed by a video I shot. I was told this noodle bar was a set piece used in the original movie. DC has one of the must-visit booths at SDCC, preferably on preview night or when the doors open, when there are a few inches of space to maneuver around and check out the costume exhibit. This year, they brought costumes from the Justice League movie. Here's a look. Some years ago, I wrote about a trip to Gero Onsen, a place well known in Japan for its hot springs and charming scenery. I recently revisited the town, and this time I stopped by Gassho-Mura, which is a 15 minute walk from the town center. Gassho-Mura takes its name from "gassho-zukuri," meaning "thatched" and "mura," meaning "village." The roofs of the 10 historical structures were made by hand using traditional methods. In fact, the structures in the village are original, having been built more than 100 years ago. They were transported to the area to recreate the ambiance of a traditional village. The site, for which you need to buy a ticket to go inside (I believe it was around 1000 yen), is open from 8:30 AM to 5:00 PM. The last entrance is at 4:30. I love these old glass containers. We've all been saddened by the recent passing of Adam West. What a fantastic legacy Mr. West, the other actors, and the whole production team left fans of the caped crusader. More than half a century after it first aired, everything from the costumes to the catch phrases has become iconic. During a recent trip to Osaka, I grabbed a few minutes to duck into the glorious Silver Ball arcade. I spotted a pinball game based on the 1966 Batman TV show. It looked so awesome that I wanted to snap a few shots to share with you. Hot Dog Toyz has produced a Chinese-language edition of Konatsu's book. It has a nice selection of her toys as well as stories about the characters. Taiwan's religious tapestry is rich, varied, and colorful. There are elements of Buddhism, Daoism, as well as various branches of Christianity and other faiths. The manager of Hot Dog Toyz is a huge Konatsu fan. She's put together a very impressive collection of Konatsu, T9G, and other sofubi, and it's currently on display at the shop. 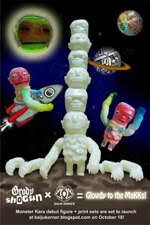 As sofubi has grown in popularity in Taiwan, the store has increased its stock. These cabinets are display only, but there are other sofubi toys available. In Taiwan, a lot of people buy their produce at traditional markets. They are crowded and raucous affairs, with granny carts and elbows flying, booth owners shouting out discounts on fresh watermelon, and the odd stray dog jostling for scraps. Sometimes, there are also shops lining the markets. You'll have everything from clothing repair shops to stores selling daily goods. A common type of shop is a 雜貨店 (zha huo dian). They sell your standard low-cost kitchen wares, household products, etc. They also sometimes have toys. Quick backstory about why I was there. I was on my way to an old neighborhood, and I had a feeling a neighbor might invite me in for coffee. Well, when you go into someone's house, you remove your shoes first. That morning, I had discovered that one of my socks, bought years ago in Korea, had developed a hole in a toe. Not a good look. As a bit of preventive defense, I went searching for a new pair of socks. Lucky thing I found some, since I did wind up visiting with the neighbors. Embarrassment prevented! We'll start with an oddly named "Deformation" toy. This Transformers KO has even reappropriated the packaging. Thorough job! And where would we be without LEPIN, one of the many LEGO knockoff brands? Instead of Ninjago, this is the renamed Ninjag line. Maybe they ran out of letters. The girls have toys to choose from, too. This "Star War" gun may be a sort of Nerf/Transformers KO? Nerformers?